This investigation took place in August 1984 in a location ½ mile downstream from the Frederick Rd. bridge at Ellicott City on River Rd. River Rd. veers right from Frederick Rd. and descends to the river bank. As soon as the road levels, about 400 ft. from the turn, you will see the back wall of an old building against the hillside. Above this wall is a BG&E sub-station (on Frederick Rd.). This property is also owned by BG&E, though at the time of this investigation there was more building structure and the area was accessible to most anyone. This area is historically known as Gray’s Mill. It was originally a Methodist Church later enlarged and fitted as a paper mill. In fact, it was advertised in 1807 as the “largest paper mill in the U.S.” Edward Gray and other investors soon purchased the mill and transformed it into a major cotton duck plant. After a major fire, Gray rebuilt the plant into the largest cotton cloth mills in the U.S. and named it the Patapsco Manufacturing Company. 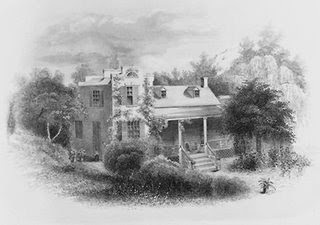 Gray built a large mansion adjacent to the mill where he, his wife and daughters lived happily for many years. In 1829, Gray’s daughter Elizabeth married John Pendleton Kennedy and the couple lived together in the mansion. Kennedy was a well known writer and lawyer in Baltimore who had reached the pinnacle of social status at a fairly young age. He entered politics and was elected to Congress, and later was appointed Secretary of the Navy under President Millard Fillmore. The list of guests and friends who visited and stayed at his home was remarkable. Edgar Allen Poe, James Fennimore Cooper, Washington Irving, Charles Dickens, Andrew Jackson, Commodore Perry, James Madison, Francis Scott Key and many more important writers and statesmen spent time at this mansion. Kennedy’s library was said to be the most impressive private library in the country containing many European first editions and works of famous friends that were never published. As well, Kennedy had a spectacular garden and grove. Washington Irving was known to spend many evenings sitting among the trees gazing onto the river. Elizabeth Kennedy would stand on the river bank and wave an American flag as the Union soldiers would hoot and holler from the train on the west bank of the river heading for Baltimore. All this would change in 1868 when the flood of the century swept through the valley and washed most of the mansion and contents away. The Kennedy’s were devastated and forced to move from their beloved valley. For several years, I had been told about strange lights and mists that eminated from the mansion area onto River Rd. at night. For many years previous, the river bank was a hangout spot for local kids until the state built mounds and barriers on the riverbank that blocked cars from parking. The sightings began after the parking areas were removed and the area was quiet in the evening hours. I had personally noticed fog in this area because it is swampy and there is a small drainage stream that flows through the location. I decided to investigate on a night when there would be minimal traffic on River Rd. (namely when the mill down river was shutdown). I received permission to park my car on a small private lot on Frederick Rd. and walked down River Rd. to the Gray’s Mill location. A friend who had worked with me previously accompanied me to the site. We decided to walk around the grounds as best we could and see if we could observe any activity. We started at 7:30 pm and used the remaining light to get our bearings to which areas of the site we would concentrate. The weather was very warm and humid in the mid 80’s and clear. I decided we would stick together because of the swampy terrain. We setup along the mansion remnants that included large pieces of granite strewn randomly. There is a small part of the back wall remaining, so we sat there and waited. As dusk came, the area comes alive with “peepers”, small frogs singing in the moonlight. Behind the wall is a high bank that extends up towards “9 Mile Hill” onto Frederick Rd. We could barely hear the traffic on the main road above and behind us. It was very peaceful as the river rippled through the valley and the moonlight bounced off the water provided dancing lights against the opposite bank. Around 10:30 pm, we heard sounds on the hill directly behind us. I figured it was a raccoon or a possum looking for a meal. After a couple of minutes, I heard a rustling in the high weeds to our left and could see movement. I pointed the flashlight towards the area and noticed nothing. As soon as I turned the flashlight off, I sensed a presence of something. My friend suddenly commented that he felt a chill sweep by his right ear. The being I sensed was definitely that of a woman. She seemed to be joyful and was definitely enjoying herself. I started to get a deeper sense of this spirit and started to 'see' the name Katherine. There were a few cold spots along the wall but there was no vibration normally associated with a vortex. Her presence continued off & on for another half hour. I tried to get an indication from this spirit if she was aware we were present. I walked around to see if I could get a better gauge of the presence. The best sign we could get was an occasional sweeping sound in the high grass. This activity continued past midnight until we noticed a scent of honeysuckle. There were no honeysuckle bushes in the area and the scent was getting very strong, almost to the point of being sickening. Then we noticed her! Directly in front of us at a distance of about 20 yards we became aware of the misty shape of a woman with blonde or gray hair in a light blue dress moving left to right, then proceeding towards the road. Then she would move back towards us. It was a very spooky sight because it seemed she would “light up” occasionally revealing her facial features and hair. We watched this for a few minutes when I decided to try to communicate. I slowly got to my feet and walked towards her. I stopped and watched her move around me when suddenly she started moving towards me. Instantly, I was hit in the face with that sickly honeysuckle scent, this time it made my eyes and nose burn. I tried to look around me but could not see nor sense her. My eyesight was blurry and I was very uncomfortable. My partner said she moved off towards the road and he lost sight of her. I then realized that I should have restrained from making physical contact. This could have easily been a serious situation if this spirit was malevolent and, frankly, I know better. All indications are that this was a visiting spectre and that there was no residual haunting, at least by this spirit. We waited for another ½ hour but noticed nothing further. Frankly, that odor of honeysuckles was still on me and I was ready to get home wash it off. One interesting side note, when I did get home my wife thought I was crazy because she noticed just a slight scent of honeysuckles. But the stench continued to get stronger, until she couldn't stand it any longer. It just wouldn't wash off...though it finally faded away about a week later. 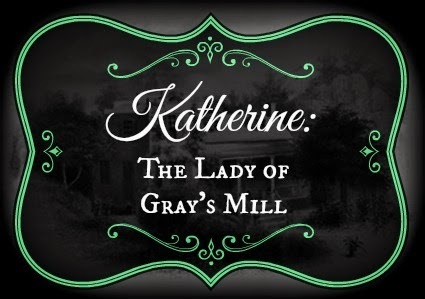 I have checked the name “Katherine” for many years and the best I can speculate is that Katherine was either a guest or friend of the Gray or Kennedy family who is drawn to this location. I never received any indications of sorrow or evil from her while she visited us that August evening. It’s too bad that this is not the case with most of the entities I have encountered.